On a bright and warm Saturday morning, there's a steady flow of people dropping off donations at Martha's Table, a charity in downtown Washington, D.C. A mountain of plastic and paper bags stuffed with used dresses, scarves, skirts and footwear expands in one corner of the room. Volunteers sort and put clothes on hangers. They'll go on sale next door, and the proceeds will help the needy in the area. It's a scene played out across the U.S.: people donating their old clothes, whether through collection bins or through large charities, to help others. Melissa Vanouse donates clothes a couple of times a year. "I think it all pretty much stays local — that's kind of the idea," she says. But it doesn't. Martha's Table, like other charities, only has so much room and can only keep clothes for so long. At some point, charities call in a textile recycling company. 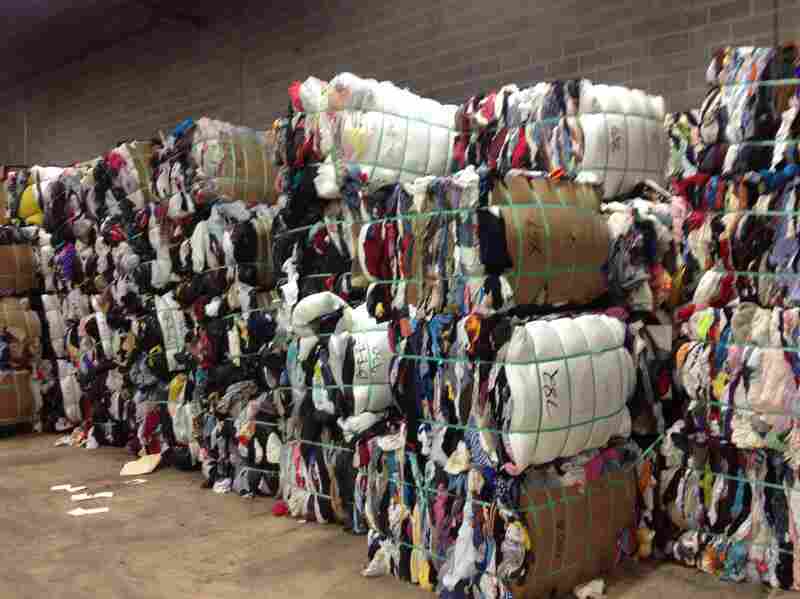 Bales of used clothing are seen at Mac Recycling near Baltimore. Textile recycling is a huge international business, and a small facility like Mac ships about 80 tons of clothes each week to buyers around the world. "Thirty percent of the materials are made into wiping cloths that are used in commercial and industrial use," she says. At Mac Recycling on the outskirts of Baltimore, a forklift shuttles large pallets stacked with bins of donated clothes. A large section of the warehouse is packed with colorful 800-pound bales of clothing ready to ship out. Robert Goode, the owner of Mac Recycling, says textile recycling is a huge international industry. He says his small warehouse alone ships about 80 tons of clothes each week to buyers throughout the world, including in Central America, South America, Asia, Africa and Europe. "Pretty much you can pick any country and there's a market for these items," he says. Goode says when the shipment arrives overseas, a wholesaler will break down the bales and send the clothes into different markets. At each step along the way in this process, someone makes money from the donated clothes. "It is an extremely competitive business. ... Items are bought and sold by the pound, and you can literally make or lose a deal over half a cent a pound, quarter of a cent a pound," Goode says. He says the business has changed dramatically over the years. Customers in foreign markets are now setting up their own operations in the U.S., cutting out a middleman. 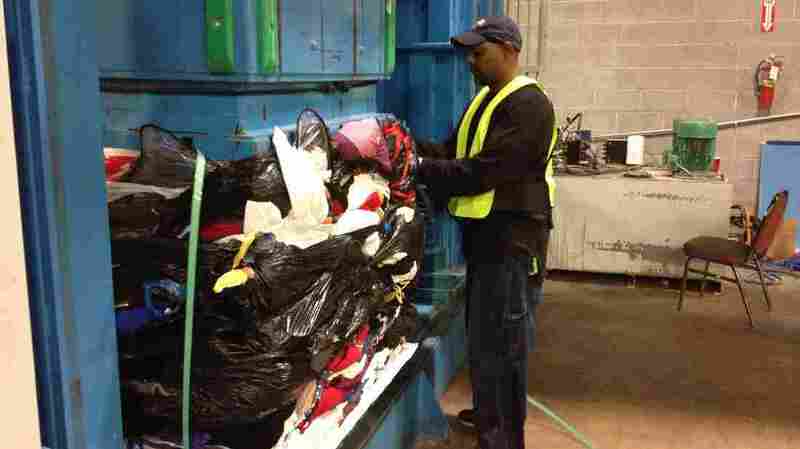 King, SMART's executive director, says textile recyclers are still finding strong demand for used clothing. But she says selling cheap garments, like those made in Bangladesh, is becoming increasingly difficult. "I think one of the problems when they're trying to sell the clothing abroad is the distinction between what's good-quality used clothing versus clothing that has maybe not been manufactured to the highest standards," she says. King says ultimately she hopes that more clothes — of good quality — are donated every year. Her organization says 85 percent of all the clothing sold each year ends up in landfills.